All transactions are safe and secure with a reliable history in online purchasing behind each of our associates. 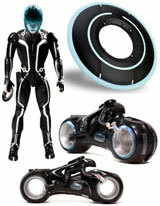 Buy the Tron Action Figures, Toys, Tron Frisbee and Light Up Discs to own Tron clothing and merchandise. Enter the game grid and get in on the action with a Tron Frisbee Light Disc that can be thrown like a standard flying disc. Other options include non-flying electronic Tron light up discs that provide the perfect costume accessory whether you plan on being Sam, Kevin Flynn or Rinzler. If you prefer a scaled down adventure, collect the Tron action figures and light cycle toys like those pictured on the left. In addition to the Tron Action Figures, Toys, Tron Frisbee and Light Up Discs above, browse the Tron Clothing Gallery for more apparel like men's and women's clothes, kids shirts or hoodies.